A nip in the air, happy faces, ethnic attires, get-togethers, candles & lights all around…yes, it’s Diwali, the most celebrated festival in India, but sadly also the beginning of the “much dreaded” toxic air pollution with rising PM levels. Our skin is the most important protective organ of our body which acts as a kind of filter for the harsh and toxic environmental pollutants in the air. One need not inhale polluted air for it to harm us as up to 60% of the topically applied substances get absorbed through the skin into the bloodstream and tissues of the body. Most of the noxious particles in the air are “nano-particles” (very small in size) which make it easier for them to penetrate skin barriers. Once these particles enter the skin they generate the production of “free radicals” which result inflammation in the skin, dehydration and ageing of the skin amongst other things. Unbroken skin helps in trapping some of these environmental aggressors in the epidermis (the outermost layer of the skin which acts as a barrier), which will eventually shed off. 1. Sunscreen – The Mighty warrior of your skin – A combination of air pollution and UV radiation damages melanocytes (pigment producing cells), and accelerates the ageing process. Early morning walkers need to be particularly careful as the air quality index is the worst at this time. Also, avoid spending long periods under the sun and this can aggravate sun mediated damage – its best to use a sunscreen even early morning and cleanse well. Nowadays, sunscreens with a “film” and / or ingredients especially directed to provide protection against pollution are available in the market. 2. 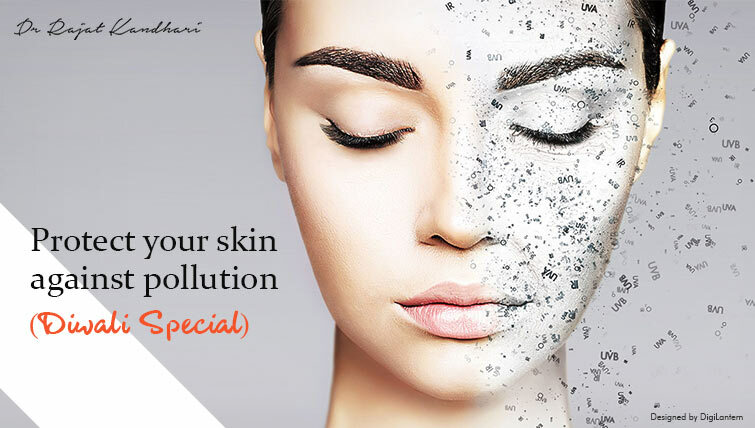 Deep cleansing your skin – Well, you cannot clean the air, but, you can definitely use a good cleanser to deep clean your skin or even better you can try some medical treatments for your skin. If you choose using a cleanser, it should be capable of deep cleaning the pores and must not be harsh to the skin. E is an antioxidant and lipid that helps maintain the skin’s barrier function by fighting free radicals and inhibiting oxidation. It is crucial in keeping toxins out of the body for which the antioxidants help a great deal. Degradation of vitamin E weakens the barrier, which increases the risk of formation of harmful chemicals, and triggers inflammatory responses in the underlying skin layers. 4. Guzzle the “elixir of life” i.e. Water – Drinking ample volumes of water helps largely in the elimination of toxins and harmful wastes. Hence, drinking water becomes more important during Diwali as the normal pollution levels are in heightened mode. Not only this, but drinking water also replenishes the lost moisture of your skin and thus imparts a healthy glow to the skin. Intake of natural juices could also prove to be advantageous for skin health. Obviously, a hydrated skin looks more supple and healthy. 5. Slather your skin with plenty of moisturizers – Using a good quality of moisturizer for your face and body can combat the ill-effects of pollution in the air. Moreover, it can hydrate your skin and prevent the chances of dryness. Application of a good moisturizer as prescribed by your dermatologist before applying makeup can keep your skin well protected from the harms of pollutants. 6. Other measures – Wear long-sleeved clothes when outdoors. This will help keep air pollution particles off your skin. Keep AC filters clean so that they can trap pollutants. Remove makeup as soon as you get home, as it prevents the skin from breathing. Even after following a skin care routine religiously, it is highly recommended to visit your dermatologist post-Diwali celebrations. He/she will advise the right treatments for your skin if required.